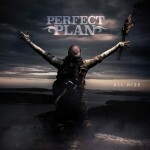 Share the post "Album review: PERFECT PLAN – All Rise"
The melodic rock world capital of Scandinavia is giving birth to an endless stream of bands- alongside now established names like H.E.A.T. and Eclipse, hardly a month goes by without a promising new band emerging from nowhere. Perfect Plan are the latest such but while the likes of Cruzh and One Desire radiated youthful promise, the band are more seasoned in years, looking in the pictures like an ageing biker gang. However musically they come over as an amalgam of all the best influences in Scandi melodic rock. Opener ‘Bad City Woman’ is both uptempo and fun (even if too close to Skin’s ‘Look But Don’t Touch’ for comfort) but is merely a taster for what is sure to be one of the best songs of 2018, a quite majestic mid-pocket song in ‘In and Out of Love’ that radiates class. Interestingly though the band take a lot of classic rock influences- both ‘Stone Cold Lover’ with a Dio-like guitar riff from Rolf Nordstrom and ‘Gone Too Far’, with a recurring guitar/Hammond battle, start off a lot heavier, but it is the quite superb vocals of Kent Hilli, somewhere between Joey Tempest and a Coverdale-like gruffness that give the choruses a distinctively melodic edge. More than once I was reaching for comparisons with the Whitesnake-influnced late nineties Scandi predecessors like Snakes in Paradise and Damned Nation, although on ‘What Goes Around’ Giant and Hardline were strong reference points. With the exception of the clichéd but fun singalong anthem ‘1985’, the second half of the album is in more straight AOR territory. The manner in which Kent’s strong, dramatic vocals soar over a balance of keyboards and crisp but clean guitar on the double of ‘Too Late’ and ‘Can’t Turn Back’ are even reminiscent of Jamison era Survivor. ‘Heaven in your Eyes’ never looks back from a classic intro in which acoustic guitar and a keyboard riff leads into a joyous ‘yeah yeah’ from Kent, ‘What Can I Do’ is another strong chorus with the keyboards of Leif Ehlin adding to the groove, and ‘Heaven in Your Eyes’ closing the album off with another slice of classic AOR, in which Kent’s soaring, almost Perry-like vocals see him rival Alien’s Jim Jidhed. This entry was posted in ALBUM REVIEWS, ALBUM REVIEWS (Mobile), All Posts and tagged album, All Rise, AOR, Kent Hilli, melodic rock, Perfect Plan. Bookmark the permalink.